Do you have an eyeglasses e-shop? So here is an essential module for your store. Let your visitors or customers try on-line all eyeglasses frames for sale on your shop. 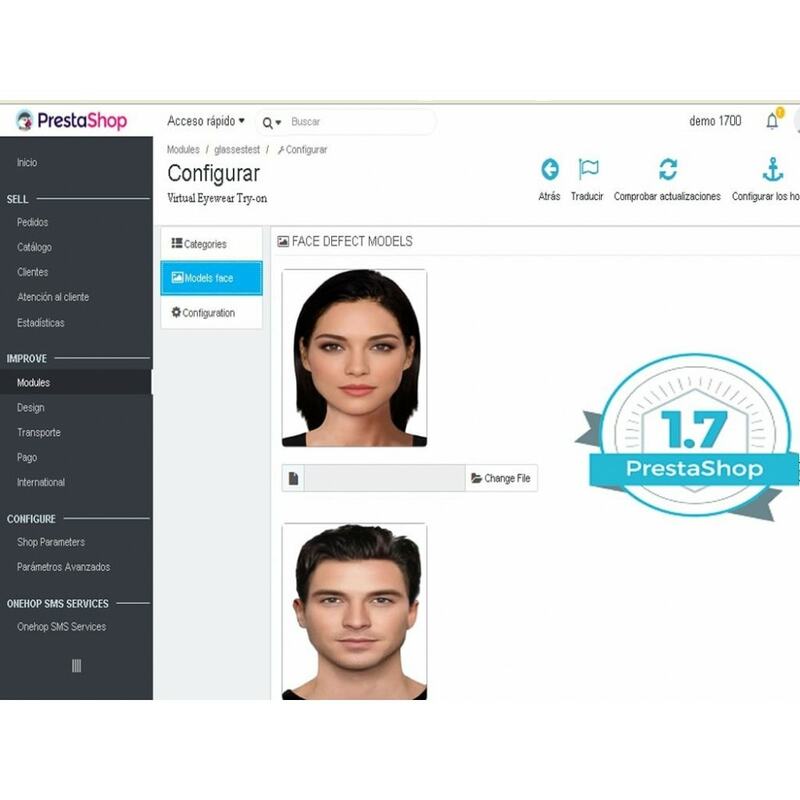 Have another sales point inside your e-shop. Increase your sales by giving an extra service on your eyeglasses e-shop. It is very simple to configure, fast and secure, and doesn't require any programming knowledge. 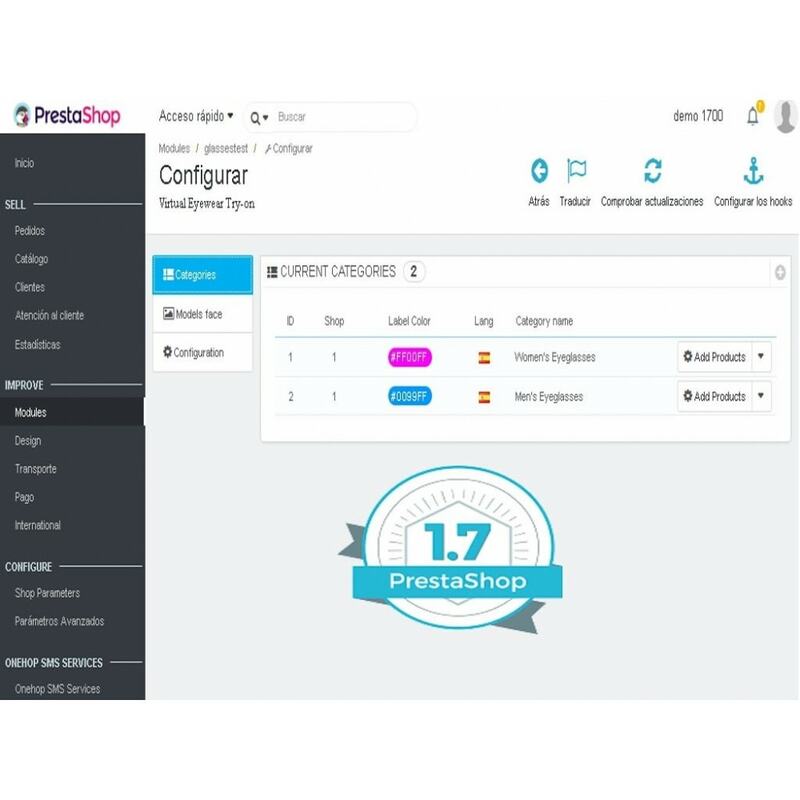 When installing, it created its own sales page, so you will get a new page on your store, which offers a convenient and necessary service. 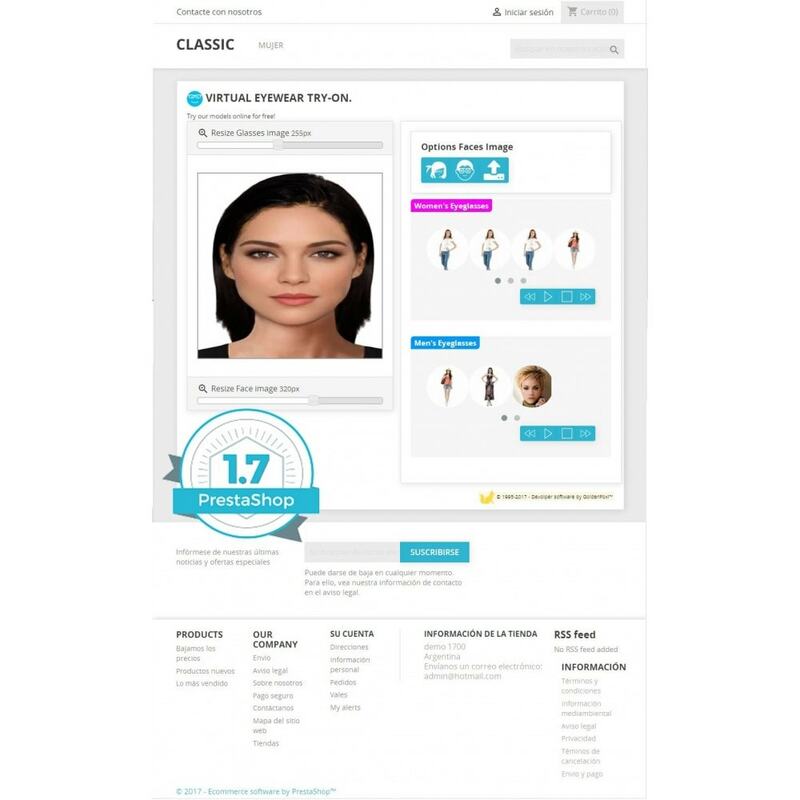 The module Glasses Test is an application which will allow cusomers or visitors to try online all eyeglasses you configure. Visitors can try eyeglasses using the modules default images, upload one or capture an image from a web cam or mobile device. This module will not save on your store any image uploaded, so it works on the visitor´s browser. They can upload as many images as they like, all will be temporal. This makes the module safer and avoids an excessive use of the server resources. All png images that the administrator uploads can be deleted one by one or in a massive way by uninstalling the module. Important: The module uses Bootstrap 3 for PS 1.6 and Bootstrap 4 Alpha for PS 1.7. 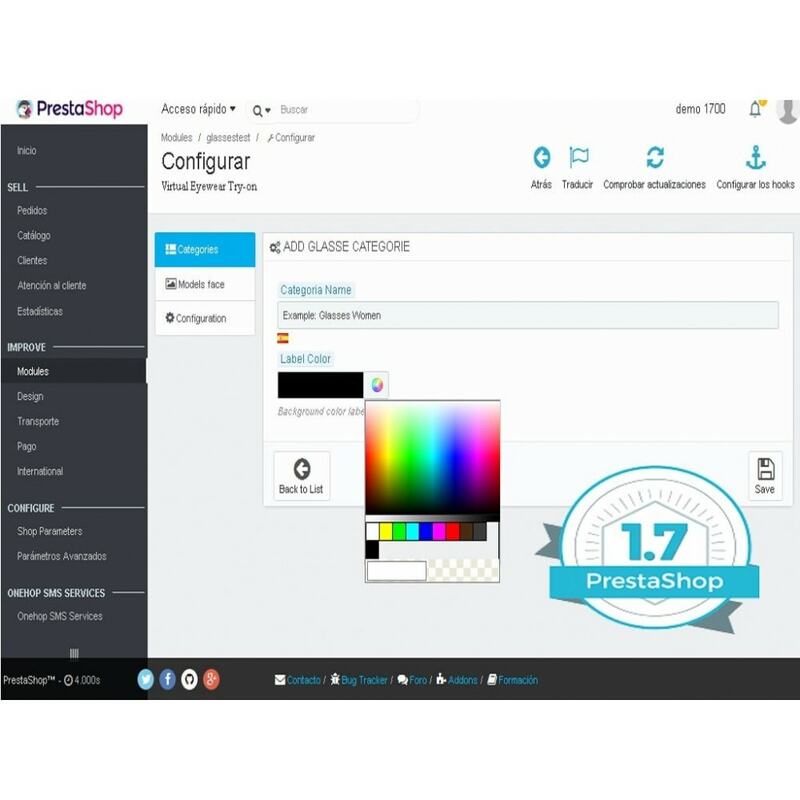 Version for Prestashop 1.7 is HTML 5. READ THE MODULE DOCUMENTATION CAREFULLY. Any questions about the module, please contact us. Thank you very much for visiting us!!!!!! Your customer can choose the eyeglasses frame it fits him best. Think about how great it could be for your client if you give the possibility to try frames on his own face before purchasing. It is a necessary service for this kind of products. This module has an user side which is very simple to use, light enough and sensitive. This module is only functional using modern browsers such as Mozilla Firefox, Google Chrome, Opera. Using any other browser you will not see the option Capture fron web-cam. Important: However the module doesn't require any programming knowledge to use it, it is necessary you know just a little about image editing, because all the eyeglasses models you use must be edited using an image editor and these must be in PNG format, transparent. When installing, the module creates 2 default categories which are empty, these are “Ladies Eyeglasses” and “Gentlemen Eyeglasses”. You can use them as they are, edit or just delete them and create your own category. You can create as many categories as you need, it is recommended not to exceed 4 or 5 categories in order to keep the design in the user side. It is your decision.